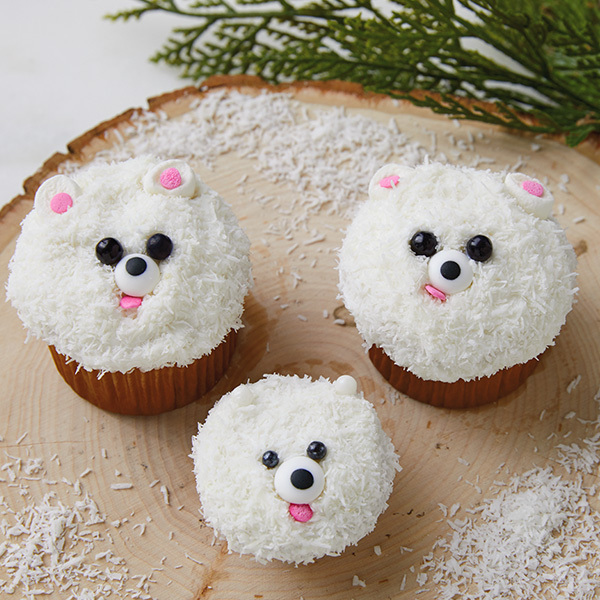 Raise the cute-factor of your cupcakes 1000% by turning them into sweet-faced polar bears. We make it easy with cake from a box and frosting from a can. Just add a few candy decorations. And because sometimes smaller is even more adorable, we’ve included a version with mini-cupcakes. The Arctic Circle never looked so adorable. Follow the instructions on the cake mix to make a dozen cupcakes. Allow to cool completely before decorating. Use an offset spatula or flat utensil to spread each cupcake with white icing. Roll the top of each cupcake in the coconut. Add one candy eye for a nose and add two black pearl candies (or dragees) on either side for eyes. Add a single piece of pink confetti for a tongue. You can change the placement to vary the polar bear’s expression. To make the ears, cut a mini marshmallow in half horizontally. Stick one piece of pink confetti on each cut surface. For mini polar bear cupcakes, use a mini muffin pan, and substitute white pearl candies for ears and smaller black pearl candies for eyes.